This morning brings with it the same wintry mix and icy conditions as Monday, though this time around it's expected to give way to heavy rains later in the day. WASHINGTON — Tuesday morning has been soggy and wet throughout much of the region, with others getting messy, cold wintry mixes and power outages — and more of the same, with the added fun of heavy rain, is coming later in the afternoon. 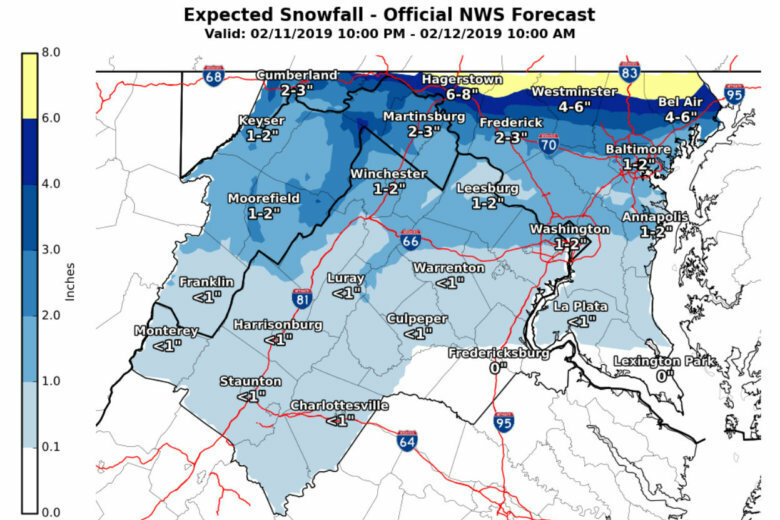 According to NBC Washington meteorologist Lauryn Ricketts, temperatures will make it above the freezing mark, but the roads remain slick north and west of D.C., with frozen precipitation near the Pennsylvania border and Interstate 81. Commuters in Virginia have largely been contending with rainy conditions, but the morning commute in Maryland north of the Capital Beltway has been complicated by slick conditions. We are getting numerous reports of downed trees and power lines in Howard County, as well as northwestern Montgomery County. Be aware of hazardous conditions if venturing out this morning. About 7,000 BGE customers in Maryland are without power — most of those in Howard County, but also Montgomery, Anne Arundel, Baltimore, Carroll and Prince George’s counties. In Northern Virginia, more than 1,500 Dominion customers are without power, mostly in Loudoun County because of freezing. The company says their crews are out and they expect power to come back on as it gets warmer and the ice melts. Nearly 1,300 Rappahannock customers are out of power in Fauquier, Rappahannock and Warren counties. More than 400 NOVEC customers in Loudoun County don’t have power. The federal and local governments in Maryland and Virginia have remained open. Maryland public schools in Baltimore, Carroll and Frederick are closed; Virginia public schools in Fauquier, Frederick, Loudoun, and Prince William counties have a 2-hour delay. Rappahannock County Public Schools are closed. A winter weather advisory for parts of the area expired at 10 a.m. As temperatures rise, rain is replacing the sleet and ice, and that rain could get heavier into the evening commute and cause flooding in low-lying areas. According to the National Weather Service, the region could see anywhere from three-fourths of an inch to one inch of rain. TUESDAY: Wintry mix early, mainly north and west of D.C. Freezing rain switches to all rain around 10 a.m. Some heavy rain possible late in the day; flooding possible. WEDNESDAY: Partly sunny and blustery. High: 40s; wind chills in 20s and 30s. FRIDAY: Cloudy with a chance of rain. High: Mid-50s to near 60.